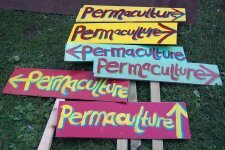 Including a new Weekend Permaculture Design Course (weekends Feb-June) starting in Feb. There are still a few places left … AND thanks to a kind benefactor (past PDC participant) Applewood can now offer bursary places for the concessionary rate – up to 50% off! We Have to Keep Talking About the Elections! Our daily bulletin is sent every day at 5pm with any new posts that day. No news = no email! Our weekly roundup is sent every Friday at 5pm with a summary of all the posts that week.